Oil and gas operations implement a variety of asset types; there are many different pipelines and many different purposes. Trunklines, for example, generally are production lines that transport natural resources such as crude oil or natural gas from a long-distance pipeline to a processing terminal. When bringing offshore product to onshore refining operations, these lines are often connected to slug catchers. A slug catcher is a piece of equipment often found in onshore refining facilities. Its function is to separate gas and liquid before they reach the processing terminal; it also acts as temporary liquid storage. In the third quarter of 2017, the ROSEN Group started a project to inspect such a trunkline, specifically a 231-km condensate line in South East Asia. This lengthy line connected an offshore production platform to an onshore slug catcher. There are two trunklines to shore: a 28" gas pipeline and the one we inspected, which is an 8" condensate line. The slug catcher is designed to handle liquid slugs of up to 12,000 bbls and 750 MSCFD of gas. The objective was to collect high-resolution data to gain insights into any metal loss. Of major concern to the customer was the monitoring of corrosion growth, since a previous inspection yielded a wall loss feature of 40% depth in the second section of the pipeline. The real challenge was revealed in the operating conditions of the trunkline itself. With a flow rate of 0.23 m/s, an inspection would take 14 days from launcher to receiver. With the metal loss monitoring goal in mind, it was determined that the best measurement technologies to be applied would be Internal Eddy Current (IEC) and Axial Magnetic Flux Leakage (MFL-A). 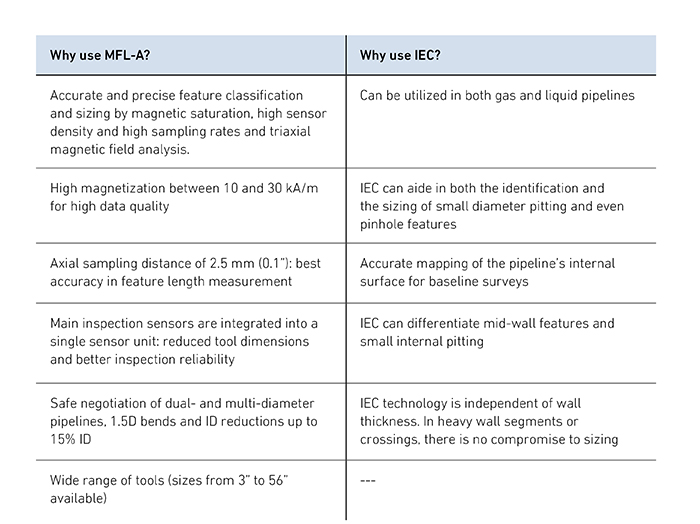 The benefits of MFL-A and IEC as measurement technologies are length, especially regarding metal loss detection. Due to the extreme length of the pipeline, the inspection had to be carried out in two separate intervals to sufficiently cover the full length. Because of the low flow rate, the travel time of the inspection tool would be extended dramatically, and battery capacity had to be increased. However, as is so often the case, even after all things had been considered, the onsite setup presented yet another challenge. The barrel length of the launcher would only allow for two additional battery segments to be added to the system, limiting battery capacity to eight days, six days short of the predicted 14 days that would be needed to complete the inspection with one run. This only solidified the need for two intervals, focusing first on the back section of the line and then the front. Once the plan had been set and operations could begin to complete the inspection, a challenge of a different nature presented itself. Before we could commence, a recovery run needed to be performed to dislodge a third-party cleaning pig which had been stuck for two months. ROSEN’s high-performance single-bolt cup pig recovered the tool and was received in good condition. To ensure proper pipeline maintenance continues, the costumer plans on applying ROSEN cleaning tools as part of a monthly cleaning program. As operations continued, multiple special-setup cleaning pigs removed any excess sand and sludge. The special setup consisted of a 3-segment cleaning pig applying both cups and discs, which would ensure that it could properly clean the entire length of the pipeline. Difficulties in operations presented themselves once more, as launcher and receiver were controlled by two different operators, each presenting different terms and conditions and operating procedures. After completing the cleaning program, we were finally able to proceed with the first IEC inspection (November 2017), which focused on the second half of the line from 120 km to 231 km. This was accomplished by setting the inspection gauge into sleep mode for the first 120 km, which meant it was still able to record distance but not collect data, saving battery life. This feature, available on all ROSEN inspection tools, allows for interval inspections. This run was successfully followed by the first successful MFL-A inspection (December 2017). Next, the second interval run (January 2018), zeroing in on the first section of the line from 0 km to 125 km, took place, again starting with a successful IEC run and followed by a MFL-A run (February 2018). When all was said and done, and all tools were successfully received, it was confirmed that the much-needed high-resolution data had been collected and was now being processed. The challenges that presented themselves throughout the project seemed to stack up as the project went on – from operating conditions to access restrictions and a stuck tool to logistical difficulties. However, by working closely with the operator, all of these issues were overcome and solutions found.